‘Heavens! what a goodly Prospect spreads around' - so wrote James Thomson of the famous view from Richmond Hill that has inspired so many poets, writers and artists. 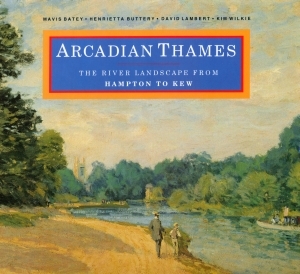 Beginning with one royal palace at Hampton Court and ending with another at Kew, Arcadian Thames describes the many historic vistas, parks, gardens and gentlemen's villas which together create such an unparalleled landscape. Based on the pioneering work of the Thames Landscape Strategy team, Arcadian Thames offers an in depth study of these river banks. Divided into twelve sections, each with a detailed map, the unique visual aspect of each piece of the river is brought alive for us by Kim Wilkie, who appraises its views and unique historical attributes. Henrietta Buttery, of the Countryside Commission, then takes us on a delightful in-depth journey into the detail of the river bank habitats and the species of plants, trees, birds, butterflies and animals to be found there. Plants such as the Deptford pink, meadow squill and great dodder, now extinct in the rest of London are still to be found here. Woodpeckers, cormorants, spotted fly catchers all thrive in a unique urban habitat. Recommendations are made for an enhancement of the river bank habitats through different land management techniques. We are then taken into the history of each reach by Mavis Batey and David Lambert, both garden and landscape historians. They highlight the large number of historic houses, parks and gardens which have been preserved and bring us up to date through the more recent phases of London's history. This section of the Thames is renowned among landscape historians as the cradle of English landscape gardening in the eighteenth century. To highlight this Mavis Batey has written a series of beautifully illustrated essays on some of the people and places to be found along the route and who were so influential at the time. She writes of the mercurial David Garrick shown here in a painting by Zoffany taking tea on his lawn, gazing out over his Thames idyll, and of Alexander Pope finding Arcadia in Twickenham. We hear of Horace Walpole, pictured in the library of his Gothic extravaganza at Strawberry Hill, also of Turner and Thomson. The newly restored Privy Garden at Hampton Court, Ham House, Henrietta Howard's Marble Hill, Syon, Richmond and Kew all come into the story. This is a book to be prized by those who enjoy the river in all its many aspects. It will bring fresh insights and understanding and a greater appreciation of the reasons why this Thames landscape - the cradle of English landscape gardening - is considered so very special in England and Europe and why its conservation and enhancement are so important to us all. The pioneering work of the Landscape Strategy Team was recognised recently when Kim Wilkie was awarded the Francis Tibbald Award for Planning Achievement in London.